Home security alarm system PH-T-5C totally have 8 wireless guarding zones, 4 hardwired guarding zones. the detector is trigged the alarm host will dial phone to inform user, and user can remotely control alarm host via phone keypad. It also have uncut function, when the outside telephone line is cut, the host will turn on the siren to remind the neighbour. working with LED display, can show the alarming guarding zones, it is useful to know which position is intruded. - 8 wireless guarding zones, 4 hardwired guarding zones. - Support 6 user phone numbers, which dialed while host alarming. - Support 13 working LED, quick, simple and clear. - Support several of ways to set guarding zone: Emergency /Delay/Part. - Send alarm data to alarm center system, while alarming. - Inside-voice module can alarm and support operate voice directive. - Equip 16 pressed-keys on host for self-program. 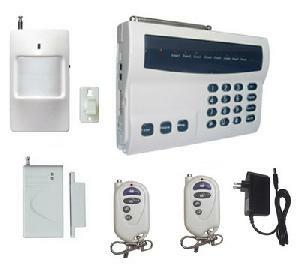 - Local arm/disarm with remote controller, the pressed-keys of the host or remote by phone. - Self-defined ring times when the host be called. - If the telephone line connected with the host be cut off, the host drives the alarm horn immediately. - Equip standby rechargeable battery.